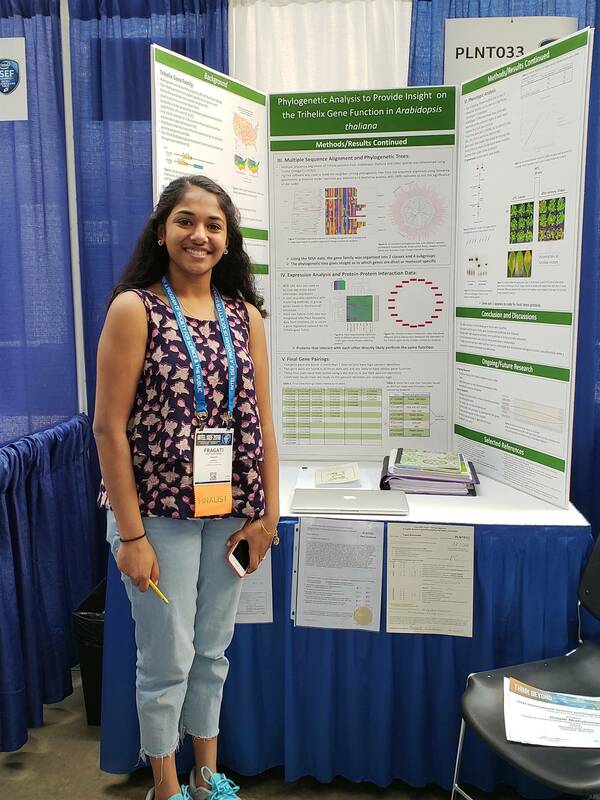 This year, the INTEL International Science and Engineering Fair runs from May 12-May 19 in Pittsburgh, PA. Commack is represented by Pragati Muthukumar and her Plant Science project, "Phylogenetic Analysis of the Trihelix Gene Family in Arabidopsis thaliana," and also by Raphael Iskra in the Microbiology category. 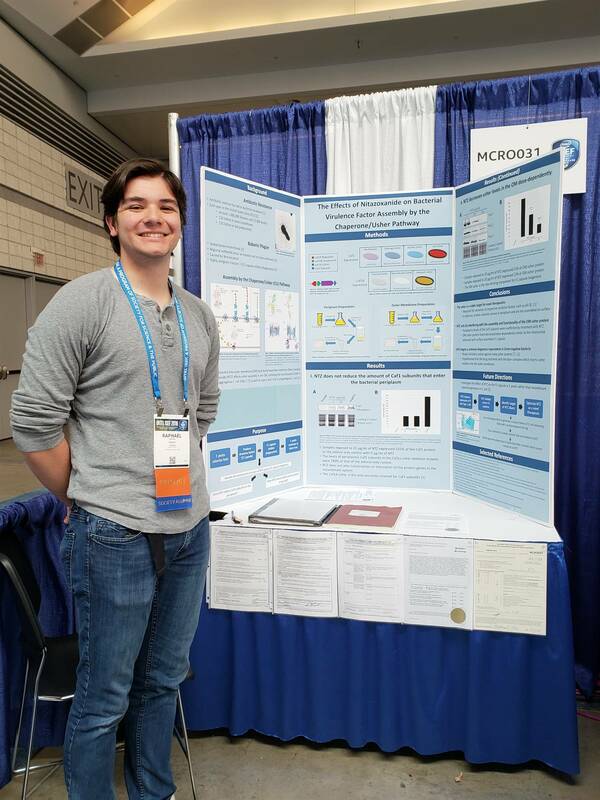 Raphael's project, "The Effects of Nitazoxanide on Bacterial Virulence Factor Assembly by the Chaperone/Usher Pathway," is a continuation of a project he competed at ISEF with last year. 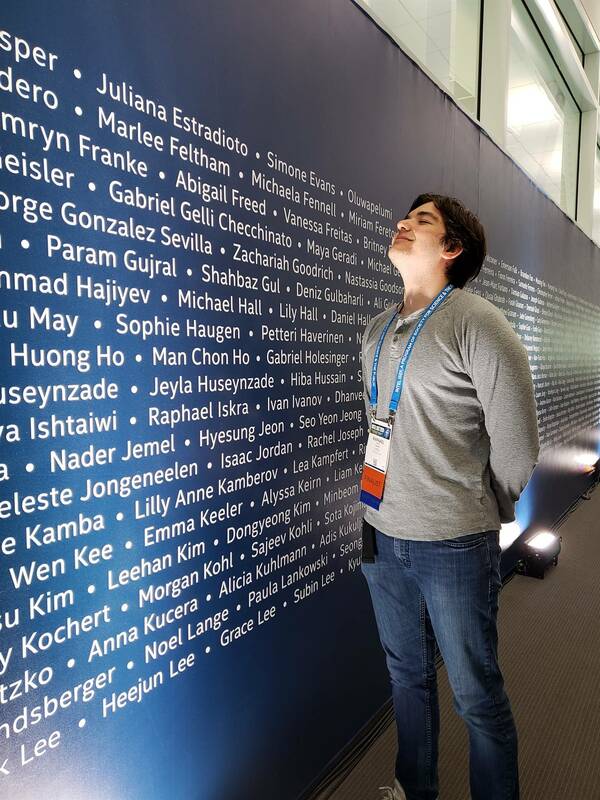 Raphael is one of the select "ISEF Alumni" that so many participants strive to be. 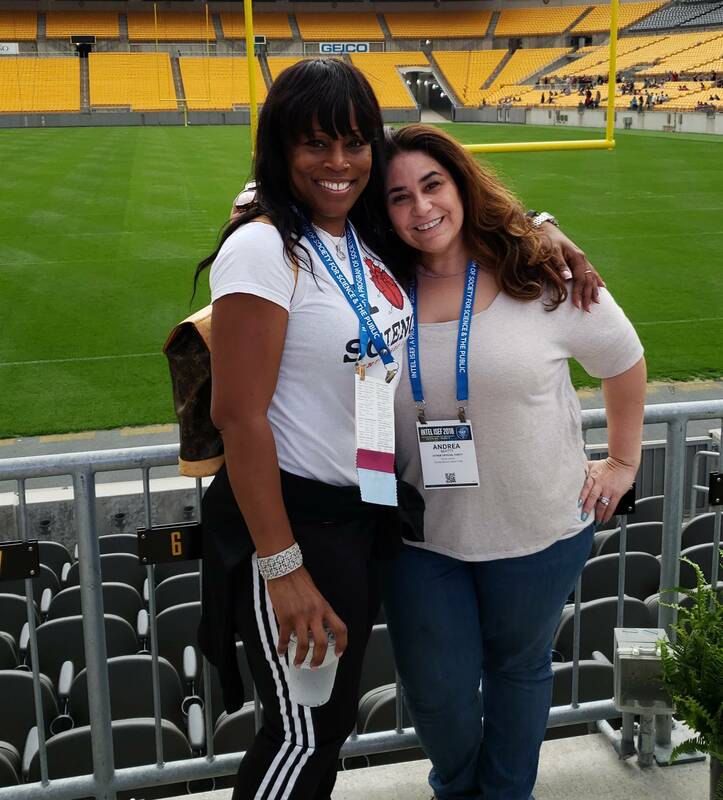 From Commack to PA: A Daily Blog from Andrea Beatty, CHS Science Research Assistant and so much more! After everyone was checked in and settled, the group met up for pizza and presentations. All the students had a chance to give a condensed version of their project and get some initial feedback. Between presentations, the students from the different schools had a chance to interact and get to know each other better. It's actually a lot of fun seeing this group of young scholars put the science away for a bit, and just play some games as they quickly forge new friendships. Tomorrow looks to be a long, but exciting day, as we will spend time in the convention center setting up the project stations. Everything they will need to present on Judging day has to be in place tomorrow. But after the work comes the reward, as they will attend a student-only pin exchange tomorrow night. Rumor has it that this is THE social event of the week and not to be missed. 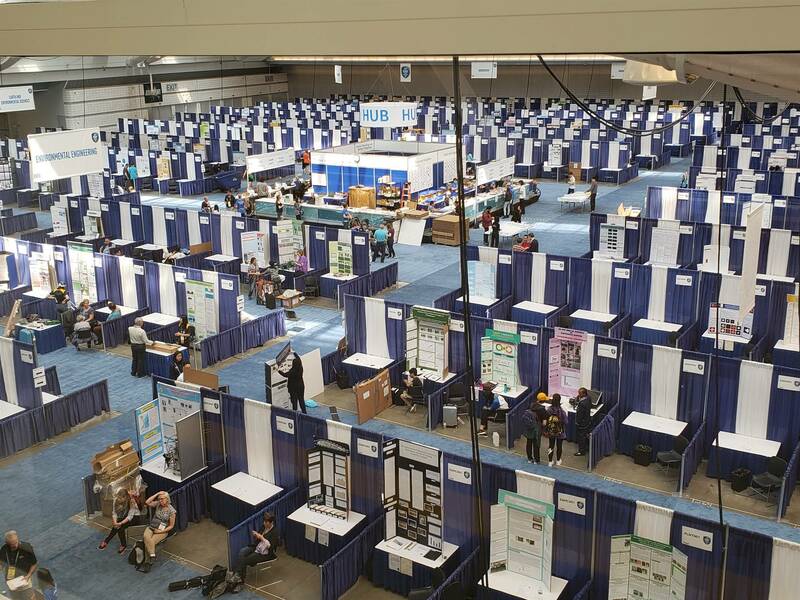 Today was ISEF registration and project setup - a pretty big task when you consider that there are representatives from over 70 countries here. Just entering the convention center had an energy about it this morning that you could sense. We see so many kids at science competitions throughout the year, but nothing really compares to the experience of seeing the students from Australia in their bright green shirts starting a chant as they registered or...Coming across so many students from Puerto Rico, in their beautifully hand painted panama hats or...Hearing the excitement of a group from Brazil while they get their official badges and...Seeing the contingent from Macau doing a news interview. Having the chance to interact with so many people who share this passion for research, regardless of geography, is really sort of overwhelming. And it definitely fueled the interest of the NYSSEF students to learn more at the night's big event, the pin exchange. But before the fun began, there was some work to do. Today was project setup day. Which, for ISEF, is a little more than popping your display board on a table and calling it done. Nope. ISEF rules are just a bit more stringent than that. After we tracked down the boards that we shipped a week ago, we had to mount all the panels and make sure they were lined up perfectly. Then the board goes on the table, and not an inch of it can go over the edges. If it's outside the size parameters, too bad. You have more work to do. You have to go the the Hub - a central supply station - and take what you need to make it work. Along with the rubber cement and binder clips, you can also get staple guns, screwdrivers, sledgehammers, and the safety equipment you need for all the hardware. Hopefully, your board isn't in need of the sledgehammer and you can leave that for the people getting their engineering projects out of international shipping crates, but it's good to know it's there if you feel the need. Aside from the board, you also have to put everything you want to show the judges on the table. Log books, journals, laptops, it has to be there. Certain forms have to be displayed at the station. Once you have everything the way you want it, you need to call an inspector to check you out. After two rounds of scrutiny, they photograph the area and sign a few more forms, and you're good. Anything you want to take out of the hall now has to get tagged by the security team and is linked to your ID badge with a QR code. Security at this is no joke, although our security guy was actually a lot of fun and shared some Laffy Taffy with us. It was a long day. We needed a taffy boost. 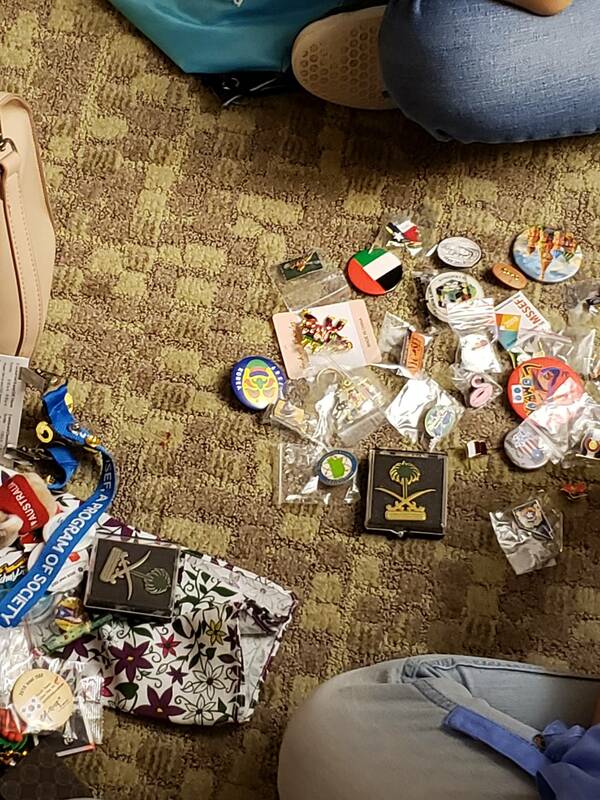 After checking out the convention center and going to the fair's retail store, where we spent WAY too much on ISEF merch, we headed back to the hotel to get ready for the Pin Exchange. The Student Only Pin Exchange. It seems very secret society. Earlier in the day we had made bags for the kids with all kinds of NY lapel pins, and they go and mingle with the other fair attendees and trade for stuff from other states and countries. While the details are as yet unknown, the after party in our conference room was kind of raucous, as all the kids compared what they got and tried to make some deals. Very coveted items included a Putin pin from Russia and enameled elephants from India, among some other really cool stuff. Tomorrow brings some more excitement, as we have our 'fun day' planned and then the official Welcome Ceremony later in the day. I'm sure there will be lots to talk about. Greetings again from another (late) night in Pittsburgh! In a nutshell, today was exhausting. In a great way, though! While ISEF week brings a lot of social events and there is always the opportunity to meet new people (like at a pin exchange, which our finalists have yet to tell the tale of, hint hint), we spent today in the company of our fellow NY'ers, while we participated in team building exercises with the LISEF group. Our morning was on the Go Ape! 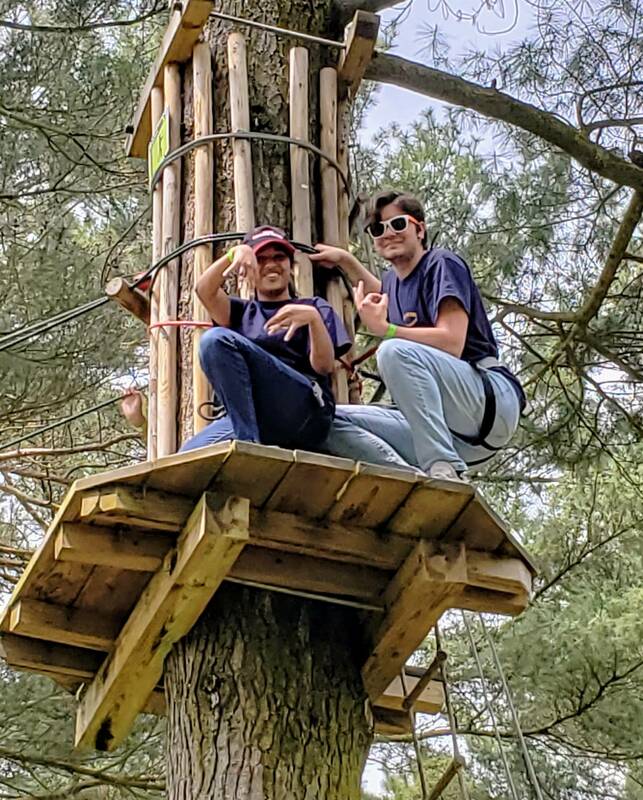 ropes course, with some pretty impressive ziplines and tarzan swings. It was great to watch the students - from the ground, thanks - interact with kids from other schools in a way they hadn't just a few days ago. What stood out the most was how they encouraged each other across the obstacles and cheered on their successes. After the ropes course and a quick lunch stop, we were off to Breakout Escape Rooms. We were divided into three groups, and sent into different scenarios to puzzle our way out of. All the groups escaped in time, but it's of particular note that one group got out in 45 minutes, far ahead of the competition. Just saying. A quick break at the hotel was followed by the Opening Ceremony Dinner, and then the ceremony itself. All I can say is, wow. What a dynamic, energized event! The preshow had video clips of the finalists, and highlights from last years fair that included a glimpse of our own Raphael. 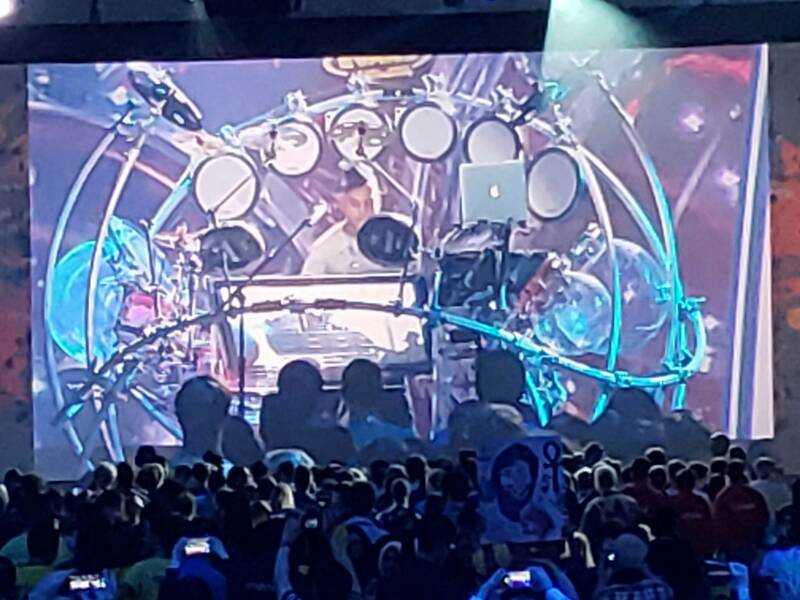 Entertainment was provided by DJ Ravidrums, who had kids from all countries up on their feet. A keynote speech from Dr. Genevieve Bell, VP and Senior Fellow of INTEL, was a high point in the night. Her talk comparing the increase in AI technology to the development of the steam engine was intriguing and thought provoking. We had a chance to tell her in person when we encountered her on our floor at the hotel. But the really fun part of the opening ceremonies is the Shout Out of the different countries, 81 in all. 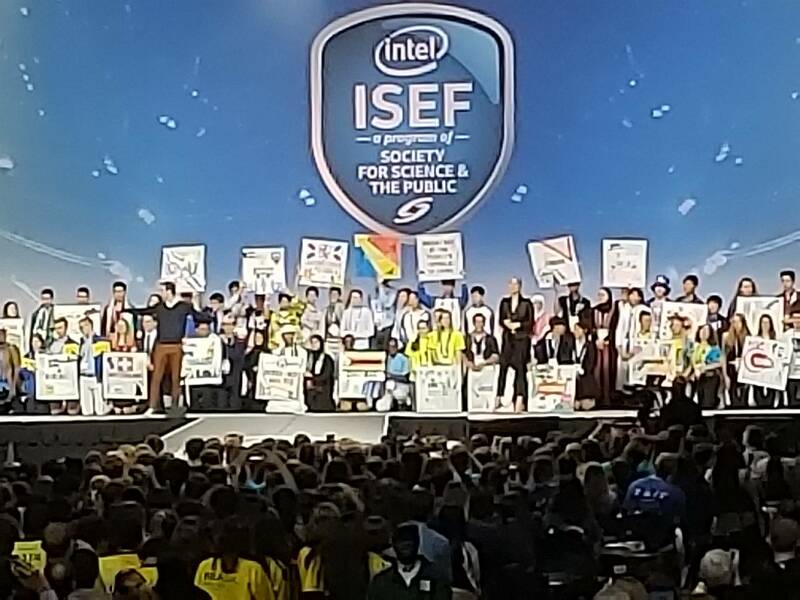 Each country chooses a few students to make a short video clip and as they're announced, they come on stage with a sign they made representing their country. The enthusiasm and applause is off the charts during the event. 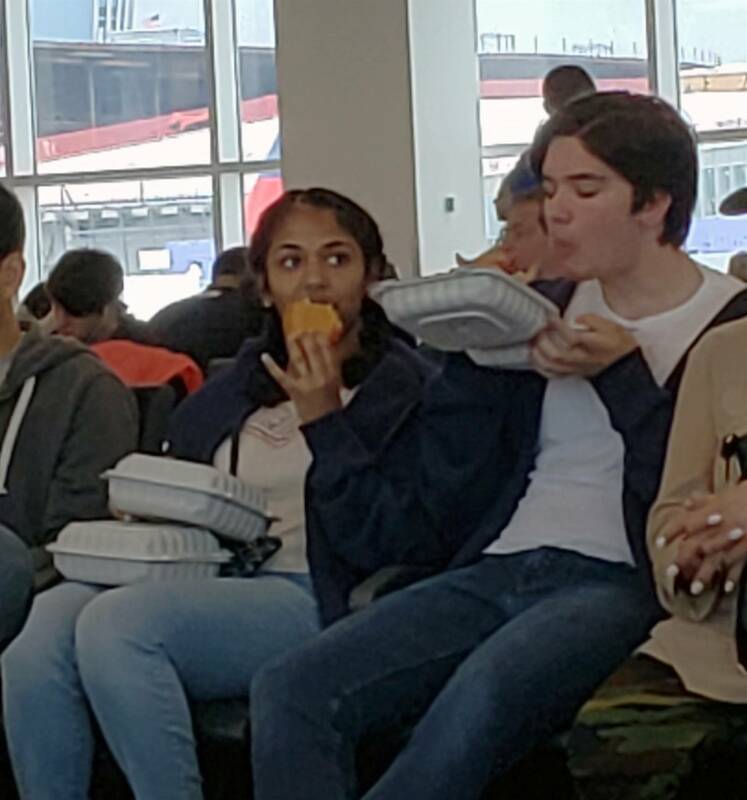 All the fun and laughter of today is going to have to hold us through tomorrow, which will be a day of practicing and refining presentations, in preparation for a long, intense day of judging on Wednesday. It's only 9:30 p.m. and I've already left our kids in their rooms. Curfew tonight is at 10 PM and with good reason - tomorrow is Judging Day. All the students are expected to be at their boards by 8 AM and judging will go until 4 PM. Unlike a regional fair, where they get judged 3-5 times, the expectation is that they will be actively presenting the entire time, with only a lunch break. They will easily see 12-15 judges, but the number can go much higher. And these judges aren't just interested science-y people. 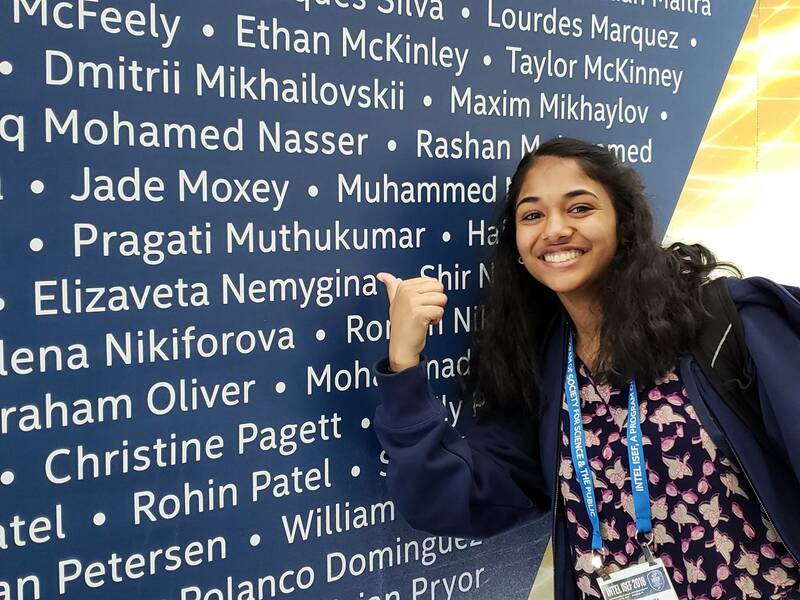 ISEF judges are all there by invitation, recognized as being some of the best in their fields from all over the world. Being invited is a tremendous accolade, and testament to the regard these individuals are held in the science community. One if these ISEF judges just happens to be Dr. Daniel Kramer, by the way. Commack is being well represented in Pittsburgh. In preparation for what will probably be one of the most intense fair experiences they will encounter, today was spent in practice and studying. The students had time slots where they gave their entire presentation, and then were subjected to a lot of questioning to prepare them for any questions the judges might throw out. Just to prepare for today, I spent time looking up information on quarks and gluons, population sustainability mathematical models, conductometric titrations, knockout genes, and what particles are being collided at BNL vs. CERN. I don't think I'm any smarter for the effort, but I wanted to have a better feel for what these kids are doing here on LI. And what they are doing is on a level that's so high - I can't fathom doing all the normal high school stuff and then mastering these really complex scientific concepts, and then using them to do new and innovative things. Things that potentially can change the way we live and operate. It's so much to try to process and I probably can't do justice to the achievements that this group is capable of. But I digress - prep day. Lots of notes, fact checking, and debate go on when trying to optimize the talks that will be given tomorrow. Some groups asked to come back and do it a second time after the feedback was applied. 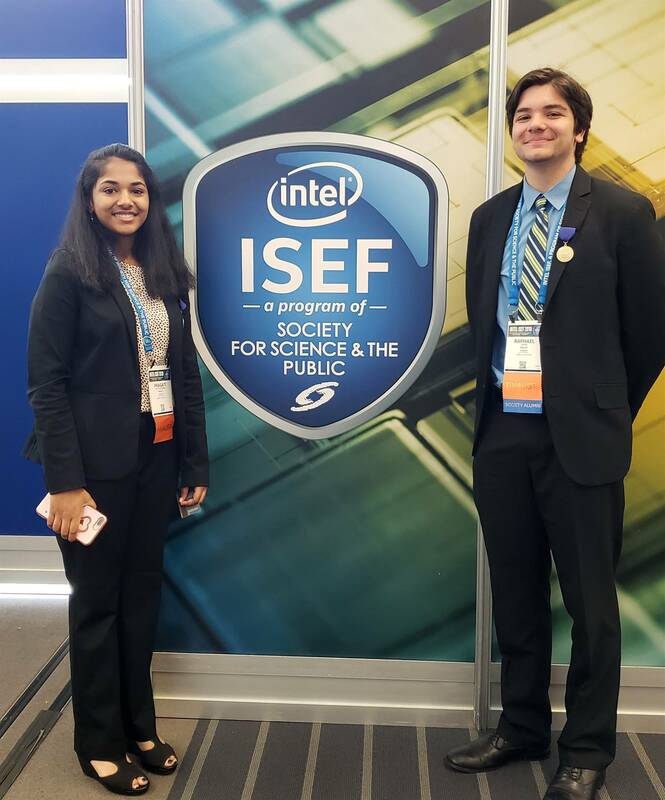 There was a mixer planned off-site for the ISEF finalists, and our kids decided not to go, as they felt the time would be better spent preparing and resting for tomorrow. I think it says a lot about them, that they know this experience they're about to have is bigger than a dj and hors d'ouvres. They'll still get their party time tomorrow night, after judging, when we have another event at Heinz Field and the Carnegie Science Center. Until then, it's a lot of work, study, and sleep getting ready for the big day. 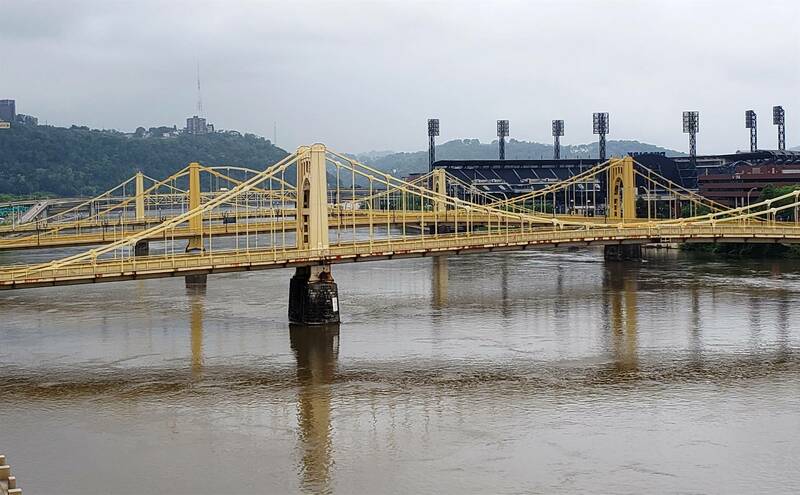 Everything we have done up to this point in Pittsburgh was leading to this day. Today. It really can be as scary and imposing as that sounds. Judges are scheduled to go to projects ALL DAY and when they finish up they can really go to any project they are interested in. Also, Special Judges are on the floor looking for the projects that best reflect their interests or those of the company they represent. Rumor has it that there is a foreign Prince who goes around looking for the right project to give his package of thousands in cash to. A few kids claim they met him and he gave them a Follow on Snapchat. I am a bit skeptical of this fact, but people are also convinced they've encountered Bigfoot so I guess anything can be true. The fact is, no one other than the student presenters and the judges are allowed on the exhibition floor, so anything that goes on while they're in there is pure conjecture on my part. I imagine you can sense the science like a building storm in the room, about to unleash torrents of knowledge down on the masses. Wait, no...that was rain. Again. It's been raining since we got here. We met the kids for lunch and got a quick progress report, all seemed well, and back they went for more rounds of judging. Raphael checked the list of judges for his category - one is a researcher whose work he references and quotes in his paper. That's the level of judge we're dealing with, so you can imagine the pressure is on. 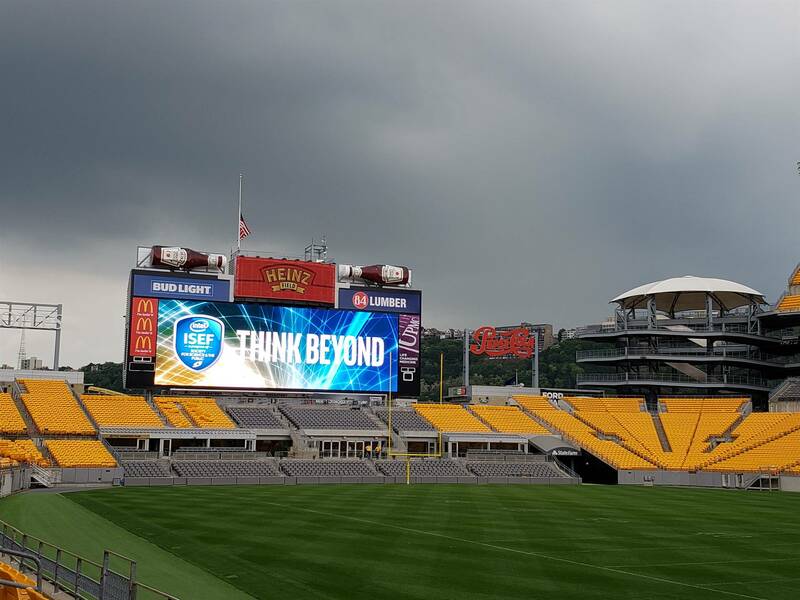 That pressure got released a bit this evening, when we traveled to Heinz Stadium, Home of the Steelers, and got to spend some time playing games and dancing while enjoying a casual dinner at the arena. 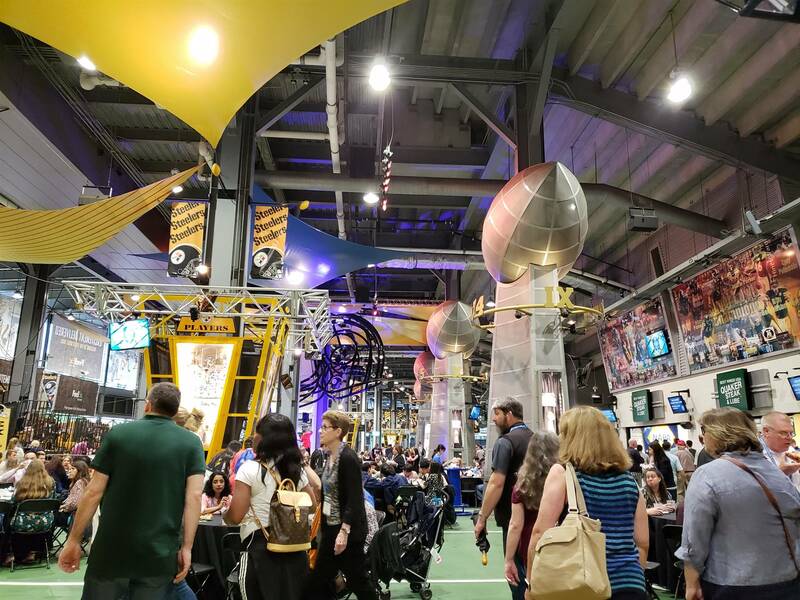 We also got to go across to the Carnegie Science Center, where there were all kinds of interactive science exhibits, robots, and puzzles. Also ice cream, popcorn, candy, nitrogen-frozen smoothies and Dippin' Dots. Needless to say, the atmosphere was a bit fun and crazy. For a change of pace, there was also a documentary on the ISEF fair being shown. (If you're still reading this blog post, knowing about the movie may interest you. This isn't the place for a movie review though so just ask me sometime). Without doubt, this was a long day and everyone was checked in to their rooms soon after we got back to our hotel. Tomorrow is another long one, as there is another day of presenting at Public Day, when anyone can go on the exhibit floor and ask questions. The day will wrap up with Special Awards tomorrow night, as our trip to Pittsburgh starts to wind down. 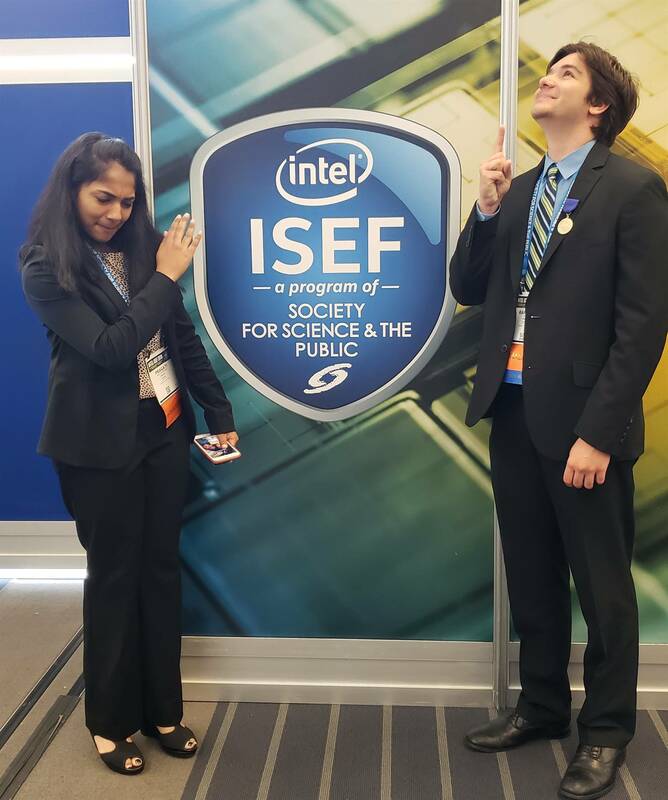 Today was a day that's kind of unique to ISEF - it was Public Day. Pretty much anyone interested in seeing the projects can come to the exhibition floor. It's an opportunity for the local schools to bring in their students so they can see what's possible from kids only a few years older than them. Seeing the younger students so excited for science that they may be doing in the not-so-distant future is really something special. When they see a project they're particularly interested in, they all gather around and ask question after question. The younger kids are very into the Engineering and Robotics categories. There is a big upswing in Artificial Intelligence projects as the technology is advancing so quickly, and it's really the only category that has a bunch of Battlebots on display. The interest level is pretty high there. Another fun part of Public Day is that many of the presenters who were in business attire for judging now get to relax a bit. And for many countries, this means that the students will wear traditional dress. We saw beautiful outfits from Japan, Canada, Hong Kong, India, Pakistan, Peru, Azerbaijan, and so many other nations. Even the United States showed off their spirit, with cowboy hats, kukui nut necklaces, floral headpieces and state shirts. After the pressure of judging, getting to just talk about the projects brings an entirely different feel to the exhibition floor. 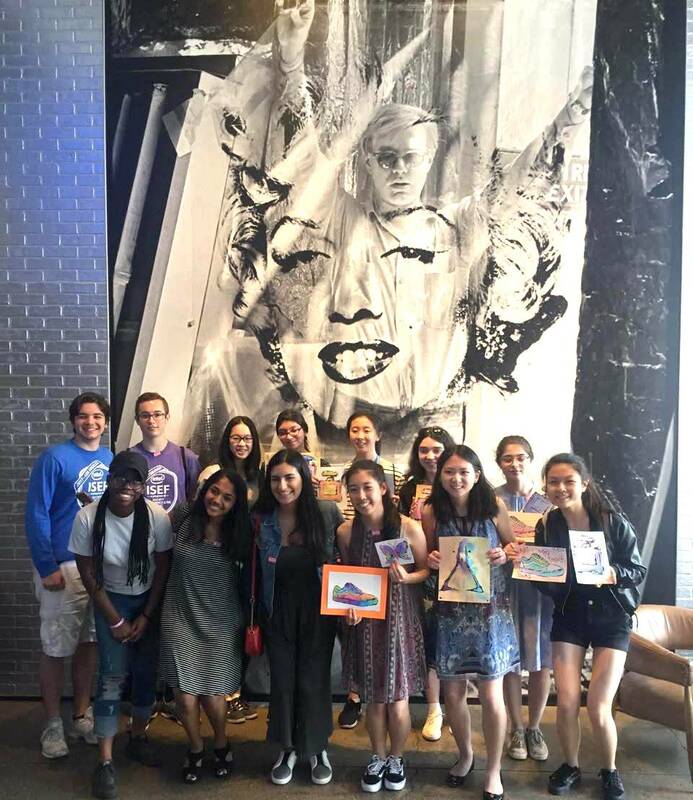 The afternoon was spent at the Andy Warhol Museum, where we learned about Warhol's early career as a commercial ad artist and his cultural influences - SO much more than soup cans! We also had the opportunity to interact with art in the form of helium-inflated Mylar pillows, as well as have to chance to create some art ourselves. Then back to the hotel to get ready for Special Awards. Special Awards are just that - special, and specific to the company, government agency, university or individual who chooses to give them. (Yes, the King was there with his wads of cash. Not a Prince, a King. Oops.) Some categories see many more awards than others based on current interest. 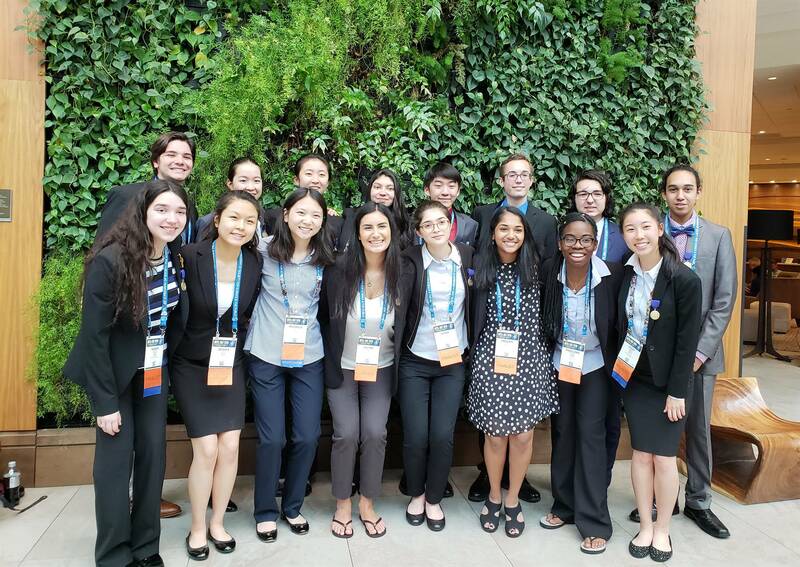 Between LISEF, NYSSEF, and NYCSEF, New York definitely showed a presence. Long Island claimed 7 awards and NYC gleaned another 4. 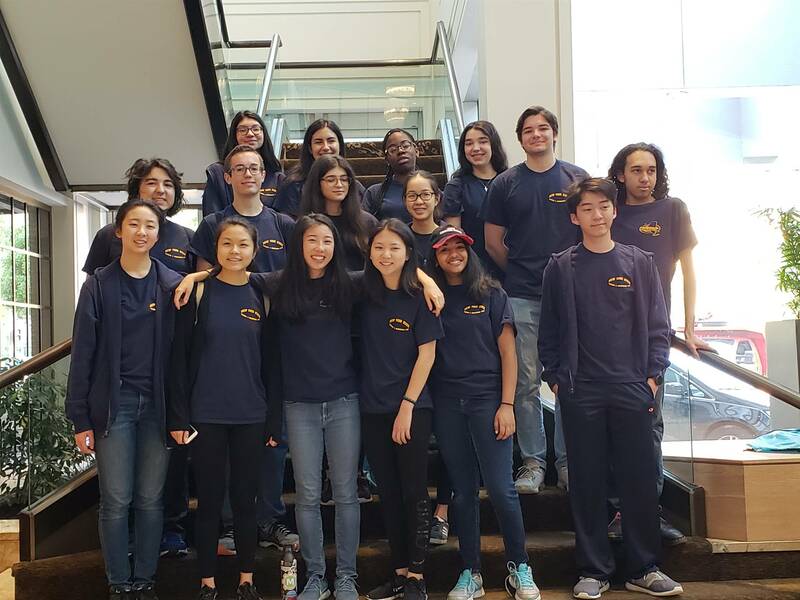 While none came to Commack directly, our NYSSEF group was well represented. Tomorrow morning brings the biggest event of the week, the Grand Award Ceremony. Everyone is looking forward to seeing what projects stand out as the best of the best from these young scientists. We are hoping to have some amazing news to report! 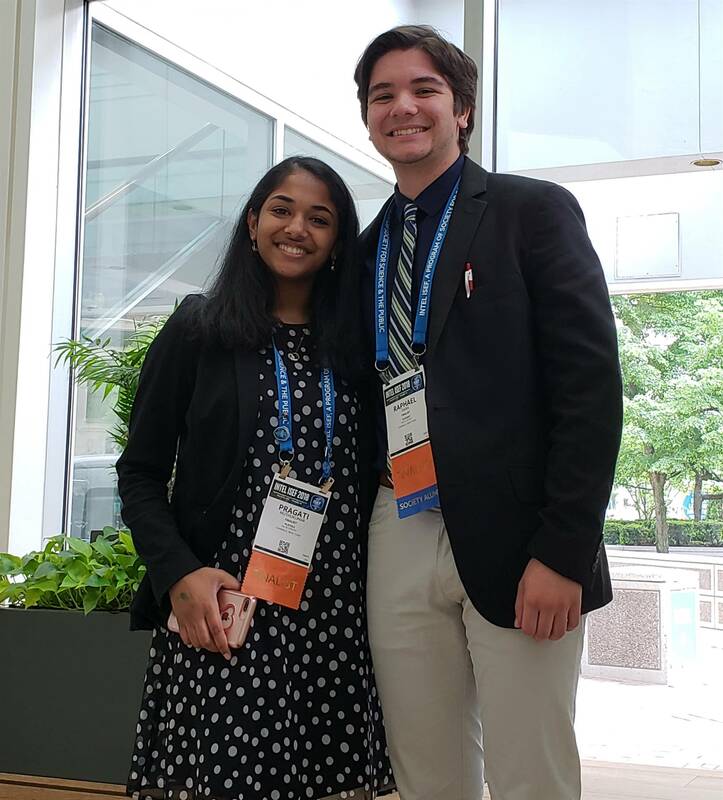 Congratulations to science research students Raphael, who took third place in Microbiology, and Pragati, who won second place in Plant Sciences at #ISEF2018. 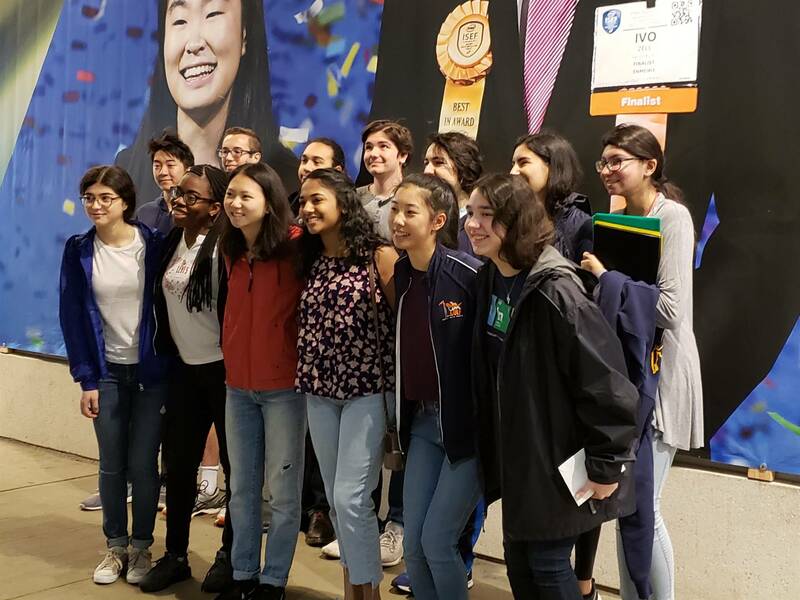 Our Commack students competed with students from all over the world, representing 70 countries and the U.S. Hope you enjoyed reading about their action-packed week as they competed in the prestigious International Science & Engineering Fair. 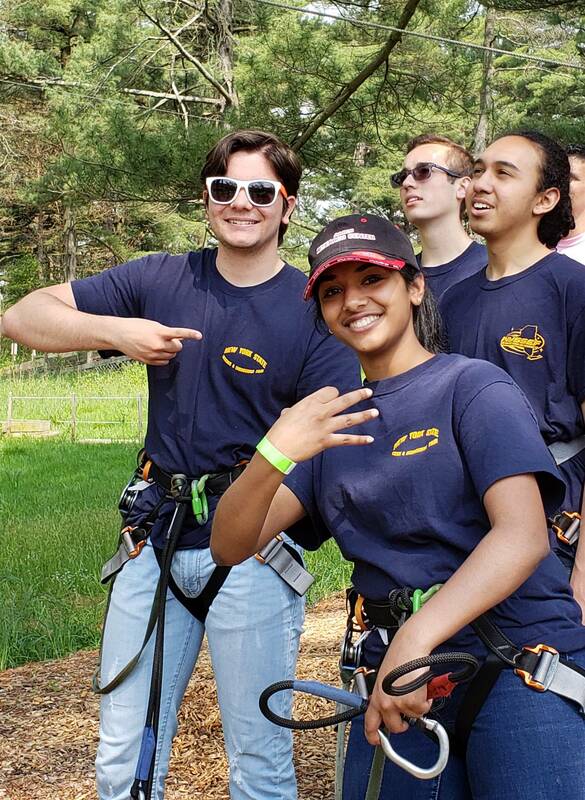 #CommackProud of Pragati & Raphael!